Having such a great experience at Bistro Du Vin at Shaw Centre at Orchard, Mr NGFL and I checked out the new outlet at Zion Road. 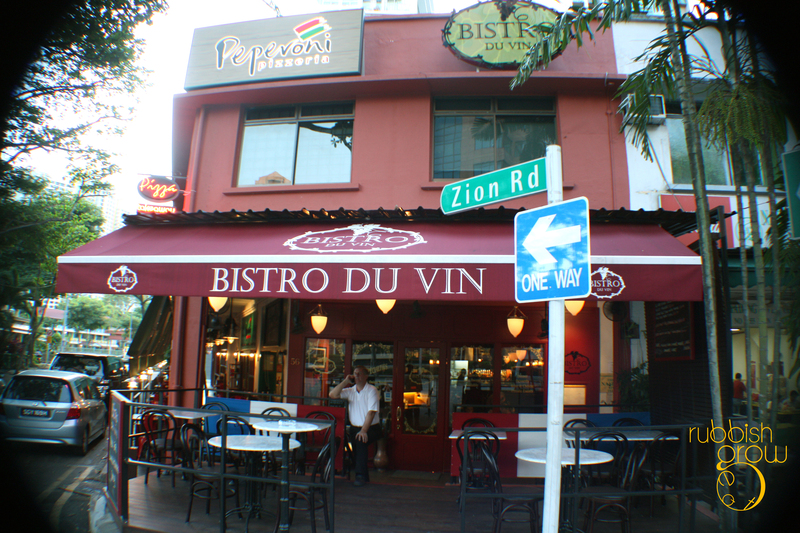 Situated across Great World City, and beside Zion Road Riverside Food Centre, the outlet is at a corner. You can’t and shouldn’t miss it. What we understood from Philippe Pau, the director, is that Bistro Du Vin isn’t about to have chain restaurants. (Good, RERG hates chains.) The two restaurants are helmed by Chef Dalton Fong, whom we met previously at Shaw, a very humble and courteous chef. What is available at Shaw is available at Zion. However, a new chef will come to the Zion outlet in a few weeks, to oversee the operations run smoothly, and the new chef may put his or her dishes up as plat du jour (dish of the day). The difference in location means there is a difference in ambience too. At Shaw, there are more women who rush to shop or have finished shopping or people who are in a hurry to catch a movie. At Zion Road, the pace is perceptibly slower, more leisurely and relaxing, people linger and will sit for hours. So it’s good for couples on romantic dates or friends in a group. Before the entrees, we were greeted with a glass of Laurent Perrier NV champagne ($17) each. Fruity, green-apple-ish, an excellent aperitif. We soaked up the sauce with our complimentary french loaf which was very good, soft inside and so crispy on the outside, it made a sound like potato chips. After we finished, a bowl of warm water with lemons was given to us each to wash our fingers. Warm water! Can you believe it? It’s not even room-temperatured water. We were won over by this thoughtful gesture. 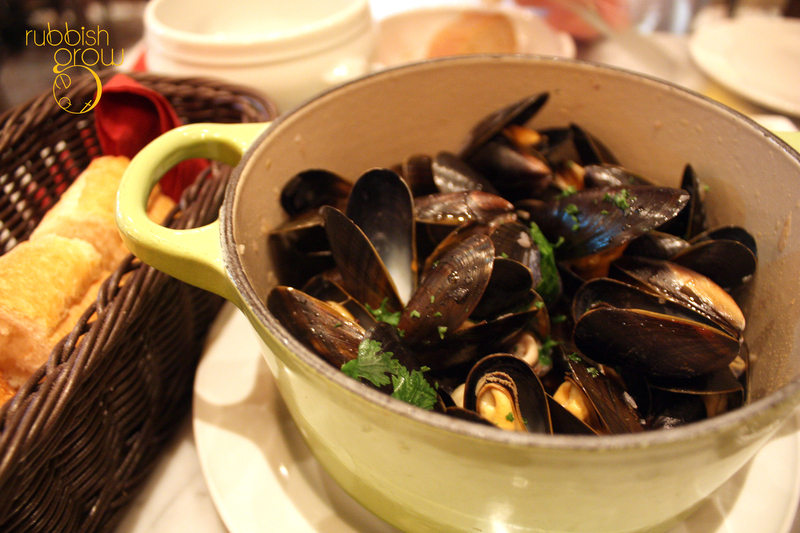 Mussels mariniere is a must-order. Very delicious and the portion was so huge we were already 50% full! 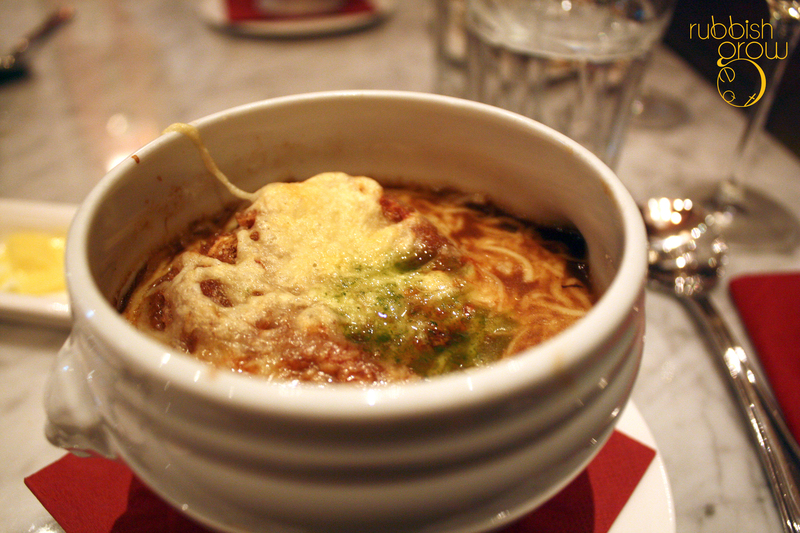 We asked to split a bowl of french onion soup ($14), recommended by Irwin. (You can ask the kitchen to split a bowl of soup for you so it comes in two bowls.) When it came in two bowls, we asked if it was one or two servings because of the huge portion. It was one serving. It was phenomenal, so flavorsome. The onions are stewed for hours to extract the sweet essence and then a piece of huge toasted bread is placed on the surface of the soup. And stacked on the crouton is gruyere cheese, a sweet and creamy cheese. The bowl is then baked so that the cheese melts into the soup. 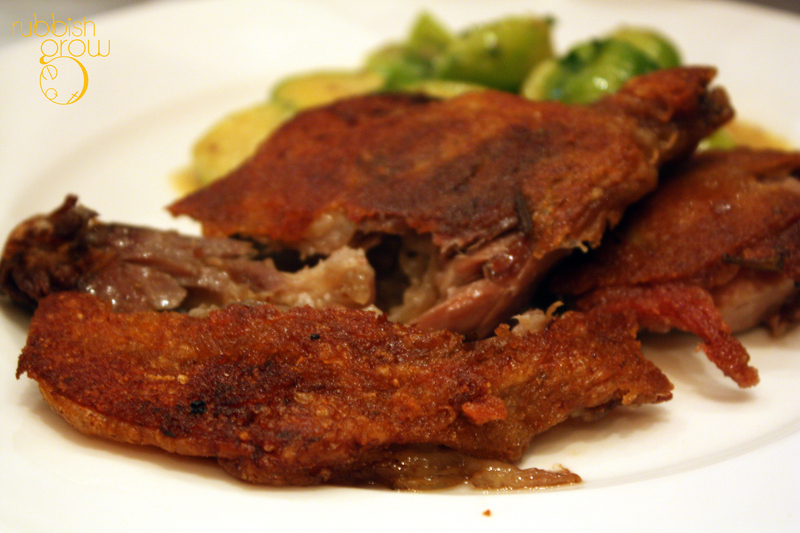 This is a simple dish with complex flavors and textures, interacting with one another. Sometimes it was the soggy bread, soaked completely with soup, with the sweetness of the bread, sometimes it was the onions, sometimes it was cheese with its long gluey strands. Sometimes it was salty and sometimes it was sweet. Nothing. Nothing was left! The onion soup is another must-order and don’t worry, because the essence is already extracted out of the onion, the onion is more for a crunchy texture than for the pungency. Your breath won’t stink, you can still kiss your date after the meal. RERG is all about foie gras. If there is foie gras on the menu, we’ll always order it. 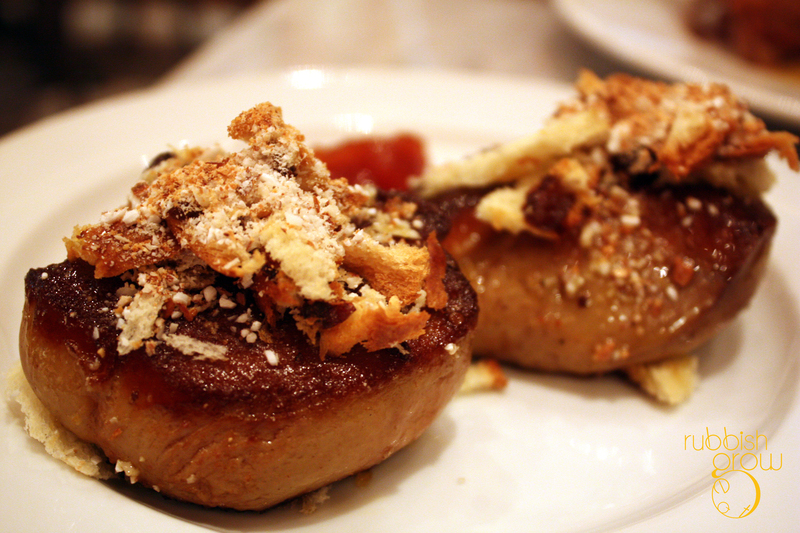 The pan-seared foie gras (80g) with brioche crumble, candied almonds & quince jelly ($26) was a little undercooked for us. Good foie gras should be firm on the plate when you’re slicing it and melt in the mouth like butter without any liver-y taste. Our foie gras was mushy on the plate and there was also a slight stench of liver. The chef explained that he didn’t want to overcook it because he wanted to keep the juice in. Fair enough. The quantity makes up for the quality. Have you seen such a huge foie gras?? It was almost an inch thick and was as huge as a big man’s palm. For the mains, we paired it with a red wine, Minervois La Ciaude A. Gros & JP Tollot 2009 ($19/glass), made from a combination of grapes, grenache, syrah and carignan. It had a buttery scent, a spicy mouthfeel and a full-bodied finish. Good for red meat in general. 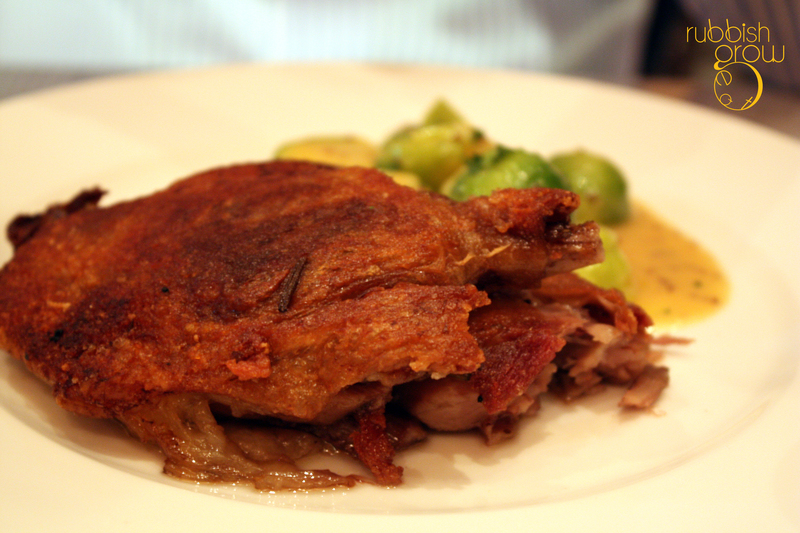 Duck leg confit ($28) is a quintessential French dish. It comes with brussels sprouts drizzled with mustard sauce (tasted like a creamy sauce they use at Ikea for salmon). Much as we like brussels sprouts, one of our favorite vegetables, it strange to use it because it is a seasonal vegetable available around October and November. Is it because the veg isn’t in season that it tasted bitterer than usual? The duck was splendid. Although the meat was a tad dry, it wasn’t as salty as other restaurants’, a positive trait. The skin was crackling like lard, so magical! The juices of the skin burst in the mouth. How is it possible something that was baked in the oven tasted as if it were deep-fried? RERG is all about braised cheeks. 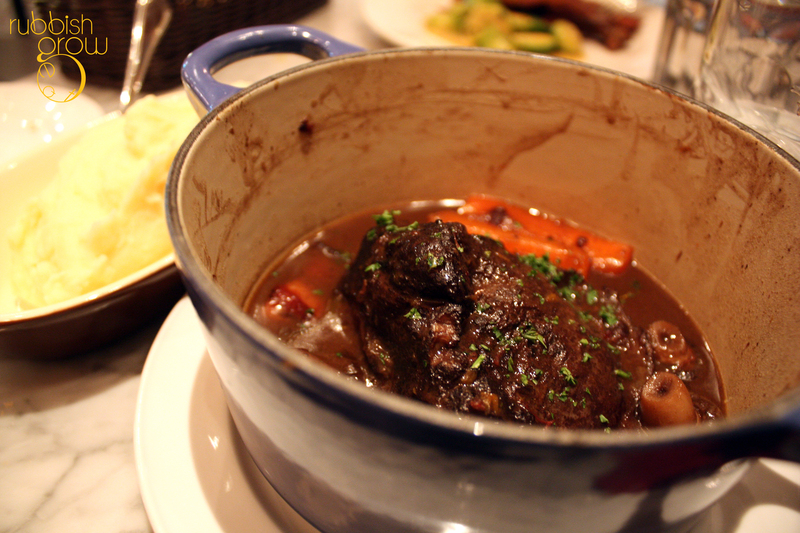 If there is braised cheeks on the menu, we’ll always order it. As a good judge of braised cheeks, this was one of the best, if not THE BEST, braised cheeks in red wine, carrot, mushroom, pearl onion and bacon ($33) ever. The portion was gigantic, hence value-for-money. It melted in the mouth and the sauces had completely penetrated into the beef so every bite you take, you’re eating a succulent piece of heaven. Even the ingredients that were used for the sauce were outstanding. The carrots, so sweet; the mushrooms, so intensely earthy; and the bacon–similar to the roasted Chinese pork belly–so fragrant. Y U NO give more mushrooms? Mr NGFL asked for some mushrooms and I was so reluctant to relinquish. I am selfish when it comes to food. I don’t like to share. 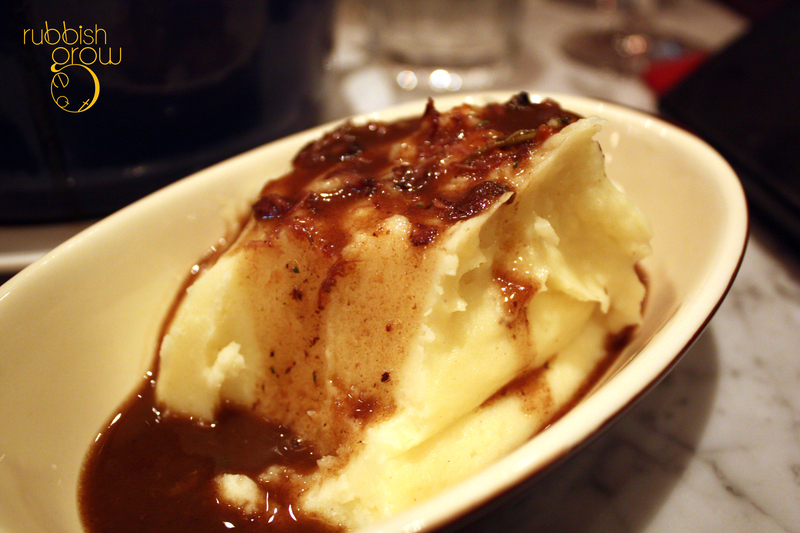 The cheeks also came with mashed potato. It was a bit dry so we added the red wine sauce from the cheeks. The flavors immediately interacted and transformed into something amazing. I don’t like potato in general but after adding the sauce, I was like, “OMG I’m so full already,” took a spoon of mashed, “Ok, I can’t eat any more,” took another spoonful, “Seriously, get the mashed away from me! !” and took some more. I suspect Chef Dalton Fong has a vendetta against my waistline. Help! RERG is all about souffles. 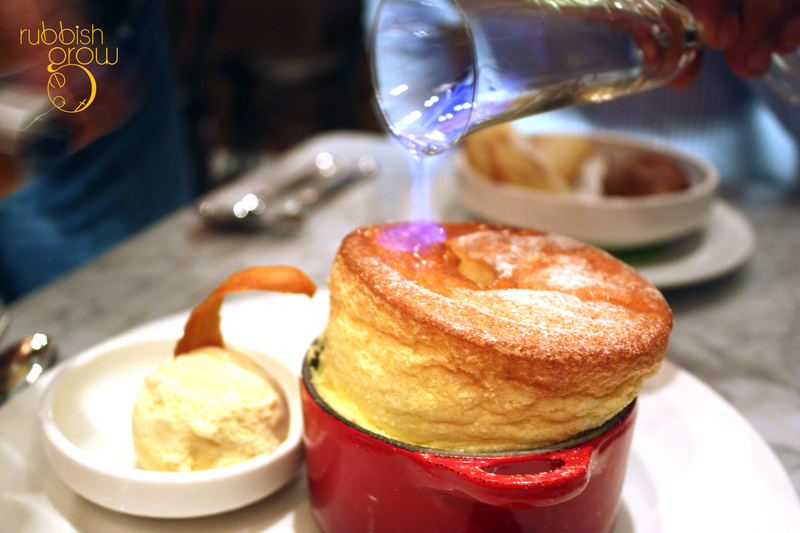 If there is souffle on the menu, we’ll definitely order it. Cheese souffle au Grand Marnier with vanilla ice cream ($12) was freshly baked and required 20 minutes waiting time. 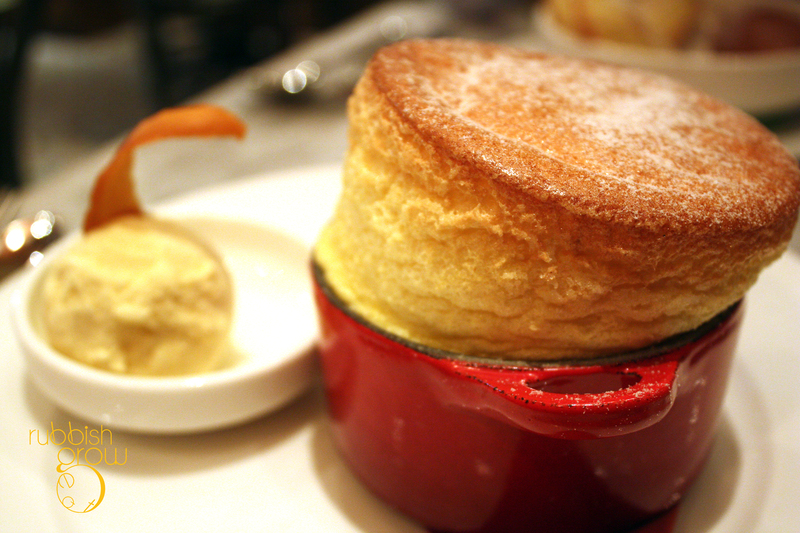 The souffle must travel from the oven to the customer’s table within 90 seconds because it would deflate. And thankfully, in this case, the service was excellent enough that the souffle didn’t deflate. 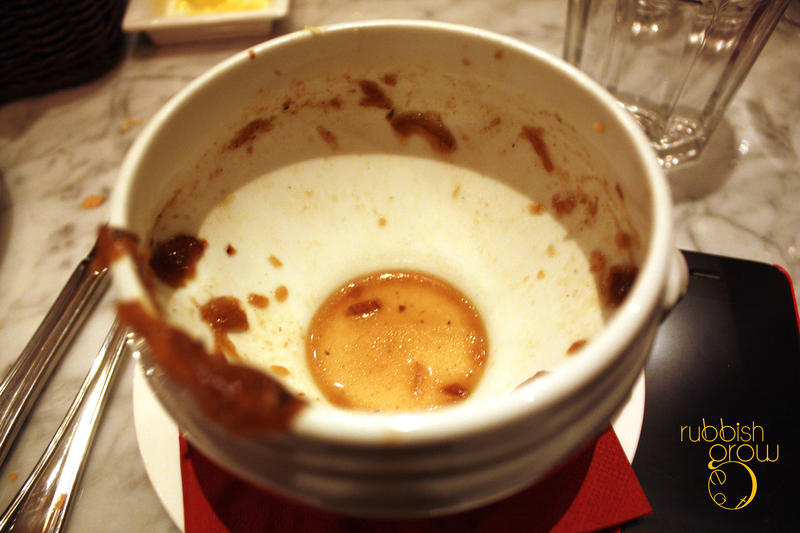 When Philippe poured an extra shot of burning grand marnier into souffle, I was jumping out of my seat like a little boy. Super fun to watch the souffle burn! 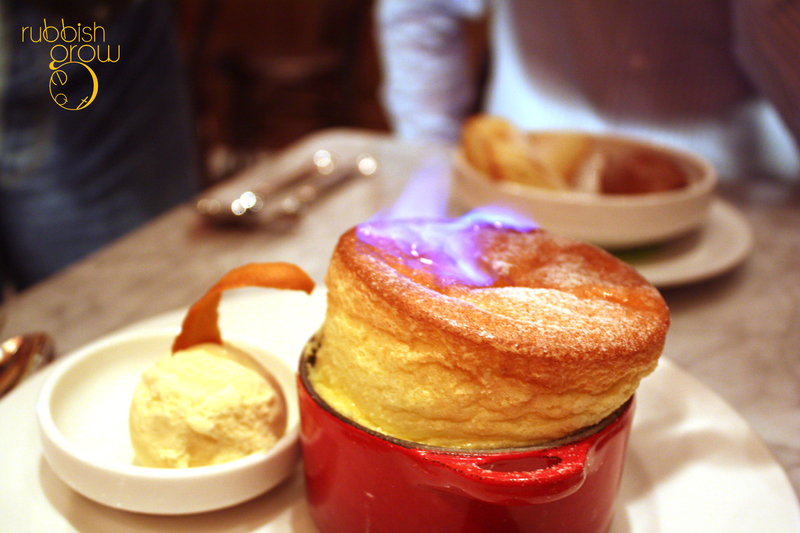 to watch the alcohol burn so that the souffle was scented with its fumes. Eating is supposed to be fun. If not, why do it? Where the alcohol touched, the souffle was bitter. But the parts without alcohol tasted similar to a very light, airy, holey lemon sponge cake, texture similar to a pandan cake. I am particular about my souffle and I admit my taste, like many Singaporeans, is inclined towards Japanese style of ethereal cakes, so I thought the soufle could be airier and lighter. MR NGFL had the freshly baked Madeleine with chocolate mousse ($10, 20 minutes waiting time). 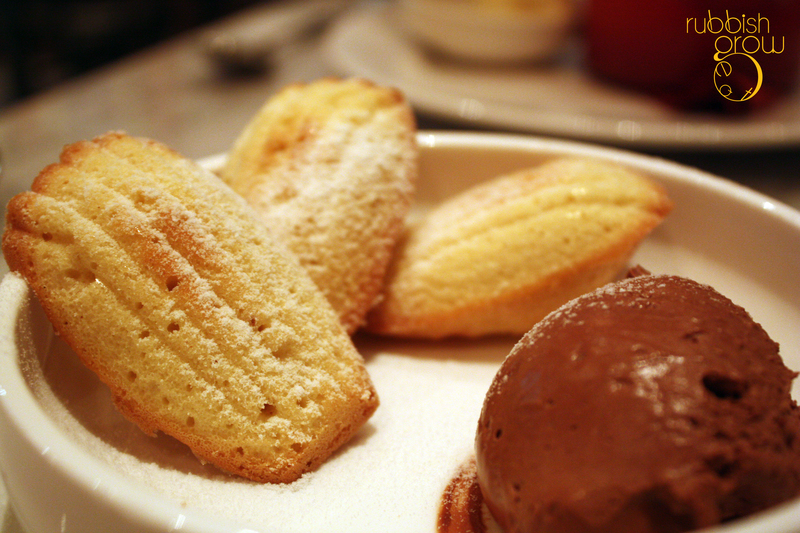 Marcel Proust, a French author, describes madeleine as ““a little shell of cake, so generously sensual beneath the piety of its stern pleating.” Such a perfect description for Bistro Du Vin’s madelines. Mr NGFL said, “The Madeleines were fairy-dusted with powered sugar and had the slightest touch of lemon. Baked to perfection: crisp on the outside but spongy inside, it is like eating a piece of cloud. If my mother were French, I imagine this is what she would bake every Sunday morning.” I may add that the pairing of the lightly sweet Madeleines and intense dark heavy chocolate mousse is very brilliant: fair and dark, light and intense, lemon and chocolate. The tastebuds were titillated from one extreme end to the other, which is why Proust’s description is so appropriate. Service: The outlet at Shaw gave some of its experienced staff to Zion Road, and Zion Road hired some new staff, so at Zion Road, there is a mixture of experienced and new staff. The mixture shows. You can tell who are new and who are experienced. That being said, no major hiccups. Everything was smooth sailing. Attentive service, water was always filled. It is barely opened for a month so give it some time, it will mature to excellence under the good management of Philippe and Irwin. 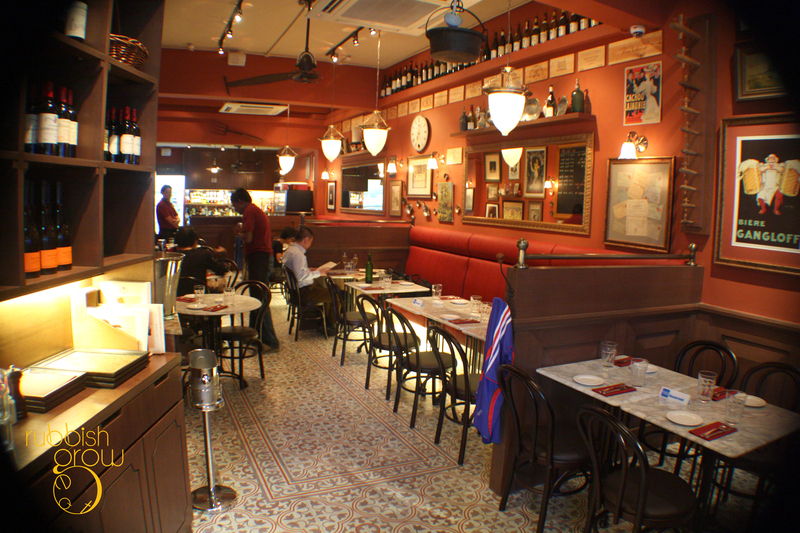 What the new outlet inspires is to keep doing what Bistro Du Vin does best–hearty home-cooked, homely, rustic French food in an unpretentious, relaxing environment so you won’t get to see any fancy plate design here. All casserole pots and simple white plates. 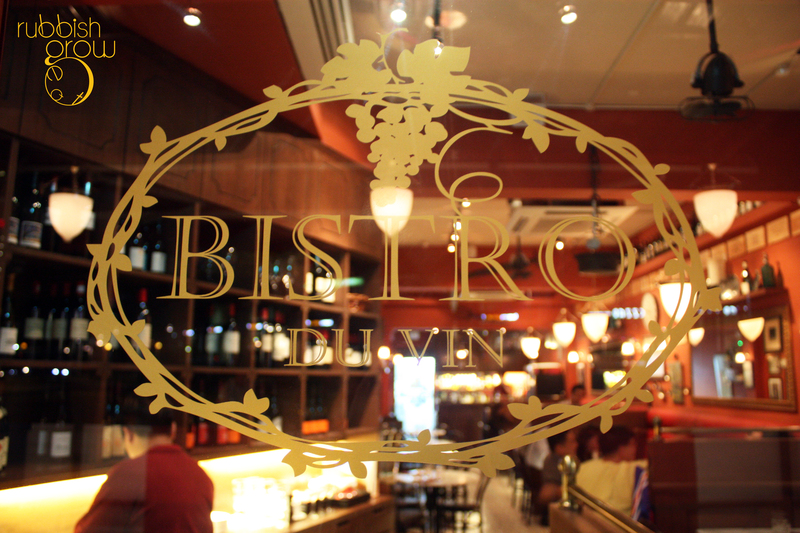 Bistro Du Vin illustrates the difference between value-for-money and budget. It is definitely not budget, each dinner can cost from $60, depending if you’re sharing the appetizers and desserts and if you have wine. But it is definitely one of the most value-for-money restaurants for sheer excess of portions, and for spectacular quality of taste in food. The set lunch costs only $30. If you’ve been following RERG’s rating, you’d know that we are very critical and you’d notice that there hasn’t been a restaurant scoring more than 4 lately until now. 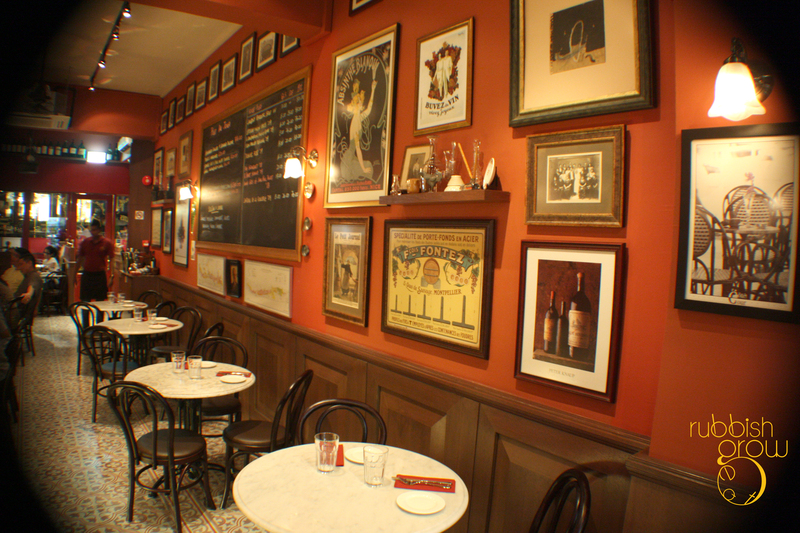 Bistro Du Vin is RERG’s best meal of 2012 so far. PS: We thank Philippe, Irwin and BDV for inviting us to the food tasting and for their wonderful hospitality. ….2 of you had 3 entrees, 2 mains and 2 desserts? Perhaps I’ll bring my GF there for her birthday….been looking for a place. We were overeating. Two persons only need to share an entree and dessert and get two mains. Should be more than enough. The portions are huge. This is definitely a good choice to bring your girlfriend.